Woohoo! Yay for girl power! She's a beauty. Treve has been named Cartier Horse of the Year at the 23rd annual Cartier Racing Awards in London. MOONLIGHT CLOUD claimed the Cartier Older Horse award. The Cartier Three-Year-Old Colt award went to the Aidan O'Brien-trained MAGICIAN, who won the Irish 2,000 Guineas and the Breeders' Cup Turf at Santa Anita earlier this month. Racing Post Trophy winner KINGSTON HILL, trained by Roger Varian and owned by Paul Smith, was named leading Cartier Two-Year-Old Colt. CHRISELLIAM, who capped off a tremendous first season with victories in the Shadwell Fillies' Mile at Newmarket and the Breeders' Cup Juvenile Fillies' Turf, was given the award for Cartier Two-Year-Old Filly. LETHAL FORCE scooped the accolade for Cartier Sprinter after recording consecutive Group One victories in Royal Ascot's Diamond Jubilee Stakes and the Darley July Cup at Newmarket. Her Majesty The Queen's ESTIMATE, who won the Ascot Gold Cup, was named leading Cartier Stayer ahead of Altano, Tac De Boistron, Brown Panther and Red Cadeaux. JIM BOLGER was awarded the Cartier/Daily Telegraph Award of Merit for 2013. I was a big fan of Ouija board and watched all of her races. And of course a big fan of Goldi. Europe has it right when it comes to the fillies racing against the boys on a regular basis. Hope we catch up. Superstar filly Treve will undergo a thorough examination after returning to France on Friday following her disappointing display in the Prince of Wales's Stakes. Last year's stunning Prix de l'Arc de Triomphe heroine lost her unbeaten record at the hands of multiple Group One-winning compatriot Cirrus Des Aigles in the Prix Ganay at Longchamp at the end of April, but was fully expected to return to her brilliant best at Royal Ascot. Harry Herbert, racing advisor for owners Al Shaqab Racing, has speculated Treve may have pulled a muscle before taking to the famous Ascot turf. She got a bit het up in the pre-parade ring and got up on her hind legs a couple of times and got a bit upset. Whether she tweaked a muscle doing that, I don't know. TREVE has been ruled out of all the midsummer middle-distance highlights by pulled muscles and is not expected to be seen on a racecourse until September. However, connections have no doubt at all that last year's brilliant Arc winner has retained all of her ability , and she is expected to be fully fit when the time comes for her to bid to retain her crown at Longchamp in October. Harry Herbert, representing Al Shaqab Racing, has revealed that Treve is "a bit sore in her back" after last week's third to The Fugue, her second defeat of the season. 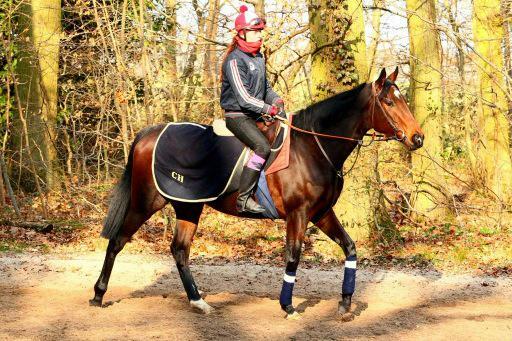 From Racing Social facebook: Frankie Dettori has lost the ride on Arc heroine, and this year's favorite, Treve. 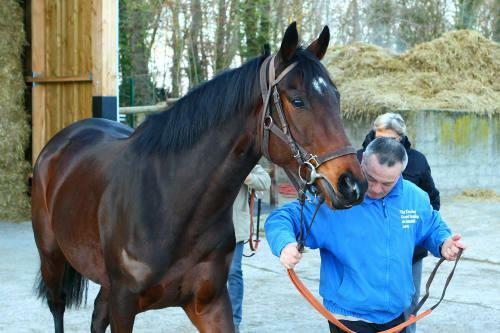 Thierry Jarnet is expected to replace Dettori on Treve. Frankie Dettori has lost the ride on Arc winner Treve and will be replaced by Thierry Jarnet at request of trainer Criquette Head-Maarek. that she was Jarnet's ride initially. Good for her trainer to support rider who guided her to most of her wins. Dettori has his choice of mounts. 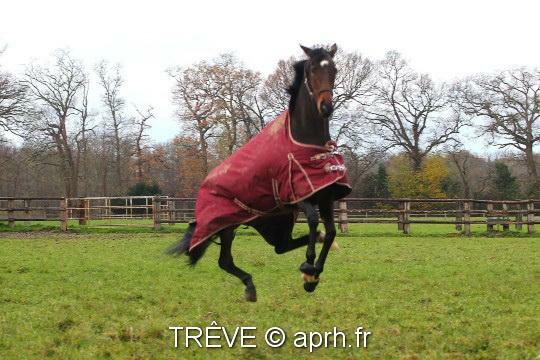 TREVE was BRILLIANT today! What a Lovely Mare she is! With her 2nd win in the Arc she is now retired and they mentioned she will possibly be bred to Dubawi. Congrats to a Great Champion!! Yet another example of the European girls taking on and defeating the boys. No big surprise. Her jockey was in tears after the ride--so grateful. I've decided that we need more velvet helmet covers in the U.S.
Croquette head sounds like she is cautious trainer. She indicated they would halt training if she exhibited any problems,I would guess her back. Good for them to give her a shot at singular racing history to be one of a kind.